The older you get, the more likely you are to sustain a knee injury. Knee injuries are frequently caused by simple wear and tear and idiopathic conditions, meaning that they arise without a discernible cause. When you can’t pinpoint the cause of your knee injury, or when it is caused by the wear and tear of a lifetime of use, there is nobody to blame, and you can’t recover compensation for the injury. 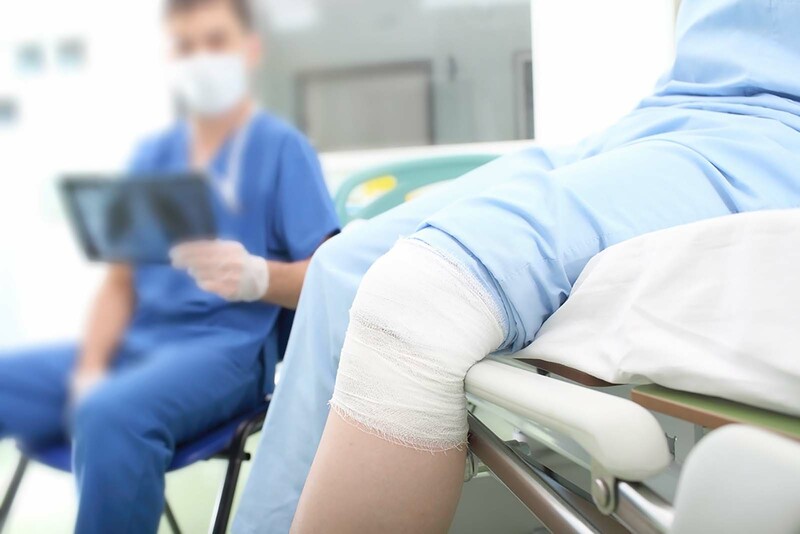 However, if your knee injury was caused by an accident or intentional harm, even if you already had a pre-existing knee condition, you should be able to recover compensation by filing a Columbia, South Carolina, personal injury claim against the negligent party. For example, if you tripped over a hazard on someone’s property and landed on your knee, you can file a premises liability claim against the property owner. Even if you already had an idiopathic knee condition or prior injury, you should still be able to seek compensation for your new injury that would not have occurred without the given event. Your knee can become injured in many different ways. As we already pointed out, some knee injuries are idiopathic in nature, arising without an apparent cause or resulting from everyday use of the knee. Some of these conditions are degenerative, meaning that they will get worse over time. A common example involves the cartilage of the knee slowly disappearing over time. Then, there are the injuries that occur from actual injurious events. You could fall and land on your knee, have your knee crushed in an auto accident, or damage your knee while lifting or maneuvering a heavy object. Many people suffer from knee injuries that arise from sports accidents or from work related tasks. injury, it can be very difficult to recover compensation for damage to the knee that occurs from an accident or event. This is because you can’t file a personal injury claim to recover compensation for something that was not the fault of anyone else. If you have a pre-existing injury, you cannot recover compensation for that injury. However, you can recover compensation for any further damage that was caused. You simply have to prove that the given accident or event did cause further damage. To illustrate this concept, imagine that you have a pre-existing knee injury that was caused by a sports accident ten years ago. You must wear a knee brace occasionally, but you are otherwise fine. Then, you slip on a wet floor at a grocery store and fall in such a way that you land on your knee. From here, things can go one of two ways. The first is that you don’t sustain any new damage. Your knee hurts because you landed on it and it was already damaged, but no new damage results. The second is that you do sustain new damage to the knee. Maybe, the knee cap is fractured in the accident. This is damage that would not have occurred if you had not slipped and fallen. In the first scenario, you cannot recover compensation for the damage to your knee that already existed. In the second scenario, you can recover compensation for the new damage that was caused by the slip and fall accident. This is where the importance of having medical records available becomes apparent. You must be able to prove that your knee condition prior to the accident was not as severe as after the accident. Your medical records will show the prior condition of your knee as compared to the new condition. Things are much easier when you have a Columbia, South Carolina, personal injury claim for a knee injury that does not involve any pre-existing or degenerative knee conditions. This is because you don’t have the same uphill battle of proving that your new injury is the cause of your medical expenses and damages. With new knee injuries, all you need to do is establish that another party was negligent or that the injury is work-related in the case of workers’ compensation claims. There are many causes of knee injuries, and they can occur in many different ways. There are three bones that meet at your knee, which are your thigh, your shin, and your knee cap. These bones can be fractured, crushed, or dislocated. Then, there are the tendons, ligaments, and muscles around the knee that can be torn, stretched, strained, or otherwise damaged. Finally, you have cartilage to cushion the impact of your steps on your knee joint, and this too can be damaged or worn down. The most frequently seen symptom of a knee injury is the serious pain that you are likely to experience right away. This pain can be a continuous issue for the rest of your life in the worst knee injury cases. You may also experience a sensation of not being able to support your weight with your injured knee. You might have a limp or be unable to walk at all. Many people experience tenderness and weakness in the knee after an injury. You might also have swelling and discoloration. To recover from your knee injury, you may require surgeries, physical rehabilitation, pain medication, and medical devices, such as a knee brace. You might even be unable to continue working. If you have suffered from a knee injury in Columbia, South Carolina, contact the personal injury attorneys at the Connell Law Firm to schedule a free consultation. We’ll answer all of your questions and help you to recover the much needed compensation from your knee injury claim.